I was scared. The only thing holding me back from starting Tribal Impact earlier was fear. Fear of selling. I’m not a sales person. I am a marketer. However, my company has been operating for just over 1 year and in that year I haven’t picked up the phone to ‘sell’ my company to anyone. The business has grown purely through referrals and relationships. You see, I don’t think you have to be a hardened sales person to get on with social selling. You just need to be passionate about what you do, understand the value you can bring and be good at building and growing relationships (both on and offline). These are skills that every employee can develop to become more customer centric. Since starting Tribal Impact I’ve been lucky to work with businesses in and outside of the tech industry and it’s opened my eyes. 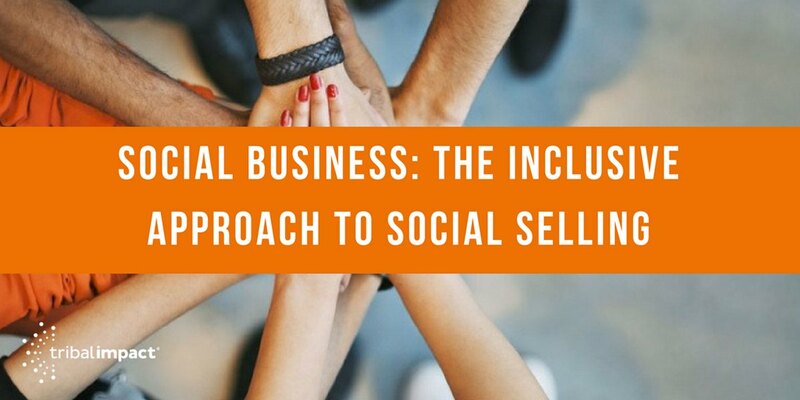 I’ve seen the tech industry continue to focus solely on social selling as a priority but other industries taking a wider, more inclusive perspective...a social business perspective. Connecting the enterprise is key to the customer experience. So, before you sign up to that next social selling summit or hire your LinkedIn branding consultant, think about the wider impact of your program. Your social business strategy. How to you connect your employees internally? Are you using an Enterprise Social Network (ESN) e.g. SAP Jam, Jive Software? Is a sharing and collaborating culture already embedded in your company? How do you physically get content to your sales team? Email probably isn’t best. Who will curate that content? Who are your experts internally? How do you extract their knowledge and experience for sharing to wider audiences? Are they creating content that your sales team could share? What topics are relevant to your customers right now? How do you feed that back into the content marketing team? What systems and processes need to be in place? What social CRM data do you have about your customers? How can you set up social listening around your customers? We already know the importance of employee trust when it comes to brand advocacy. However, there’s another ingredient that needs to be included. 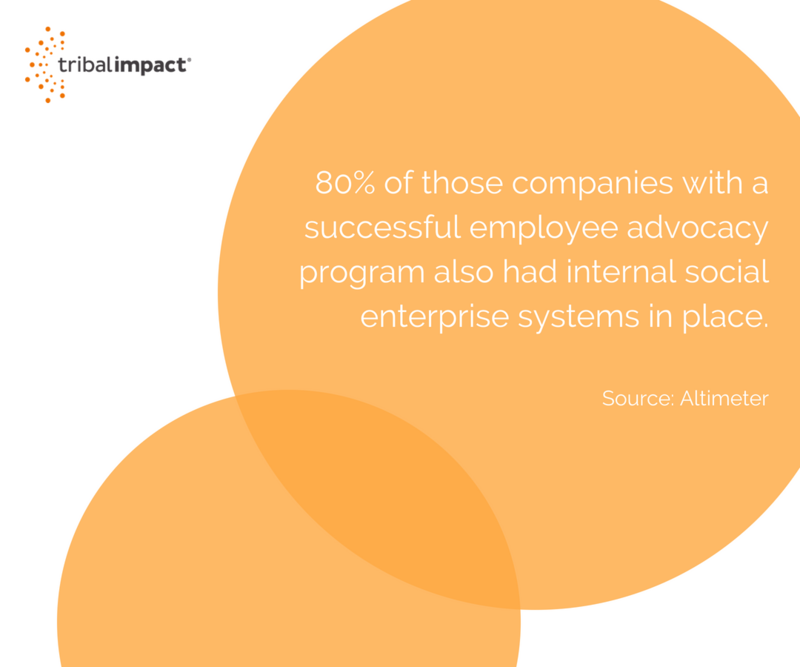 According to Altimeter, 80% of those companies with a successful employee advocacy program also had internal social enterprise systems in place e.g. Yammer, Jive Software, SAP Jam etc. Fostering a social culture internally sets the a good foundation for social business success. Leaders who aren’t afraid of transparent feedback being sent across the management layers via internal social infrastructures build trust and engagement with their employees. Yes, it can get uncomfortable sometimes when you read comments you don’t want to see from your employees, but this is part of the transformation you have to go through if you want to become a connected enterprise. Tip: Leaders, listen to your internal communications team. I honestly believe that content and training will unite sales and marketing in a way I have never seen in my 20+ years in marketing. We’ve spent way too much time throwing leads across the wall and debating over how qualified they are. In one of my recent blog posts I discussed how sales have their ear to the ground, they know what customers need, the language they use, the questions they’re asking. Marketing knows how to socially listen to buying signals, trending topics and creating impactful content. Put these two together – it’s the secret to driving a competitive advantage when it comes to social business. Tip: Sales, talk to marketing. Marketing, talk to sales. Leave no stone unturned when it comes to mapping out the customer experience. Detail out every single interaction point that a customer has with your company from accounting to the receptionist. From your homepage to your Google Adwords, from your LinkedIn company page to your logo on the outside of your building, from the people driving your support vehicles to the CEO. Every single interaction – whether it be a person, digital or object. List it. Fix it. Tell your employees about it. Tip: Operations, talk to marketing. Every employee listed in your ‘customer touch point’ exercise needs to understand (as a priority) the company purpose and how their role contributes to the wider story. They also need to know how to tell the company story in a way that they can explain it to their kids. Keep it simple. Remove the technical jargon. Simplify the language in such a way that anyone can understand the value the business brings. This is so important because your employee network has the potential to connect you way further than just your sales team. Referral networks are hugely important when it comes to social selling. You could potentially extend your sales infrastructure without hiring another sales headcount. So in conclusion, I get it. I understand why organisations that are sales driven feel that ‘social selling’ is an investment just for sales but I have first-hand experience (with my own business) where opportunities arrive from places you least expect. I’m pretty sure that your business has the potential to grow their sales team massively without the need to hire anymore headcount. What are you thoughts? Agree? Disagree? Let me know if you want to learn more about how your business can grow their sales potential via social business and employee advocacy.